Bulgaria has a problem with transparency of media ownership and financing. The society does not know who (really) owns the media, or how are they financed even when it comes to public funds - either Bulgarian or European. This opacity is ideal environment for unhealthy dependencies between media, businesses and government to thrive, which distorts the media, economic and political environment, and deprives society of pluralism and independent journalism. It calls into question the respect of democratic values in the country, thus ranking Bulgaria next to Romania and Hungary and making the problems of Bulgarian media a European problem. 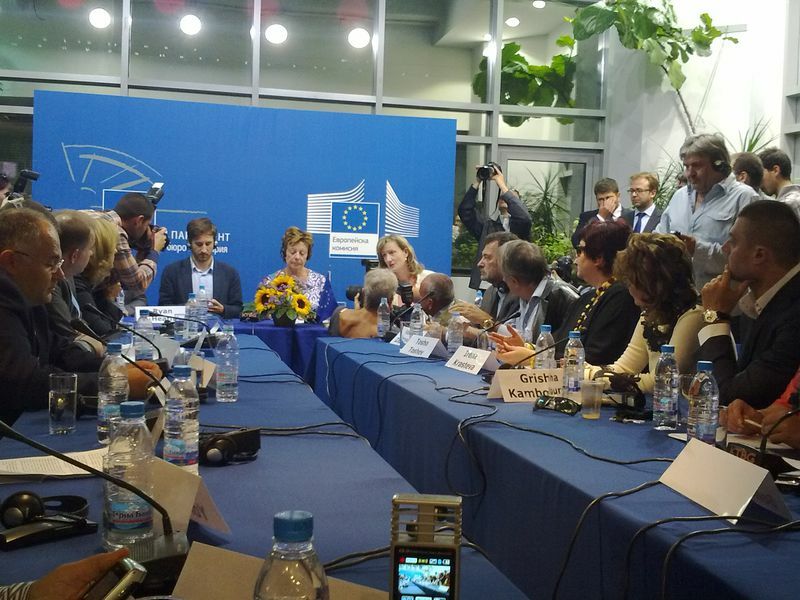 This is the diagnosis of Bulgarian media environment that has emerged from the meeting of Bulgarian journalists and publishers with EU Commissioner Neelie Kroes. Although we, in Bulgaria, have been long aware of this diagnosis, the outcome of the meeting is that the Bulgarian media problem is now a European problem. This is very important because, as even the European Commission admitted in its latest monitoring report, nothing happens in Bulgaria without external pressure. So as to have this pressure, the problems with media in Bulgaria should be discussed not only in our domestic web space by a group of active citizens but it should also be a subject of the political debates at European level. The European Union cannot remain indifferent when its core values are questioned in its own member states. iii) there is a lack of transparency about how the sector operates, then the law alone cannot solve that problem. On the point of transparency I want to be very clear. I raised the issue of transparency with your Prime Minister today. He agreed with me: there is not enough transparency in Bulgaria concerning both ownership and financing of media in Bulgaria. I then asked if he would support an effort to increase transparency – he told me I have his full support." In fact, Ms Neelie Kroes came to Bulgaria as an EU commissioner responsible for digital agenda to promote the use of Internet and new technologies as a source of growth and jobs. She fulfilled the promise given at a previous meeting with Bulgarian journalists in the European Parliament some time ago and agreed to meet with media representatives, in the face of the two rival publishers' unions (‘The Union of Publishers in Bulgaria’ and ‘Bulgarian Media Union’) and a group of independent journalists and NGOs, who have sent a special open letter asking to meet Ms Kroes. The journalists who signed the letter were represented at the meeting by five colleagues - Ralitsa Kovacheva (euinside), Sylvia Velikova (Bulgarian National Radio), Assen Yordanov (bivol.bg), Kristina Hristova (Association of European Journalists) and Vladimir Yonchev (offnews.bg). 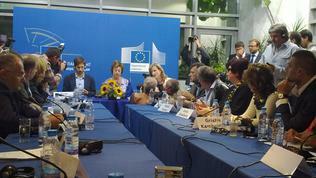 The room of the EU information centre in Sofia was overcrowded with journalists that have come either to cover the event or to just listen. 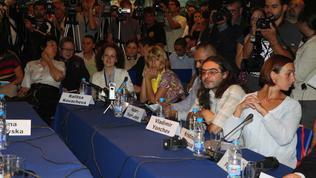 The participants were seated at two opposing tables - the representatives of the Union of Publishers in Bulgaria and the independent journalists at the first table and a solid presence of the Bulgarian Media Union at the opposite one. And during the meeting it became clear that the two tables were not only just a few feet away from each other but also a few decades in time. Tosho Toshev, editor in chief of The Press daily, said he was the oldest and most experienced journalist there, that there was no newspaper of his that was not a profitable enterprise and demanded the Commissioner to help reduce the VAT for printed press. Petyo Blaskov, editor in chief of Republica daily, said he was the created the best-selling newspapers in democratic Bulgaria and when Ms Kroes asked "How many memorials do you have? ", he replied, "Many, but unfortunately they are made of paper." Sasho Dikov, a journalist and owner of a cable TV channel, called him the Bulgarian Murdoch and defined himself as the media Fidel Castro. Nikolay Barekov, Head of the TV7 news department, gave the guests CDs with his team's investigations, as a result of which he said ministerial heads had fallen. Irena Krasteva, owner of New Bulgarian Media Group which publishes several newspapers and owns a TV station, provoked laughter in the room saying printed newspapers must be preserved at all costs because "when one reads a book or a newspaper they remember it and start thinking. When one reads something on a screen or iPad, they forget it in ten minutes." And all this amid the calls by the Commissioner for using new technologies and seeking new business models! It seemed as if the main goal of the publishers was to demonstrate their own (personal) importance, thus hinting of the insignificance of the motley group of journalists who signed the letter to Commissioner Kroes and to downplay the main topic of the meeting highlighted by Commissioner Kroes too - how to improve transparency in ownership and financing of media. None of the publishers did specifically mention this, as Ms Kroes herself noted in her closing remarks. From what I heard and from your number here, I understand that you value media freedom and independence quite high, like I am doing, but not everyone agrees what this concept means in practise, the Commissioner said. It should be clear who owns a certain newspaper or a station and where the public funds go, regardless of whether money comes from Sofia or from Brussels, Neelie Kroes noted. She recalled that the European Union had certain rules in terms of concentration, state aid and pluralism that must be respected. The Commissioner admitted that her legal tools were limited but that did not mean that her voice would not be heard or that she could not push for a debate. Because the problems will be solved through a transparent debate, not if we pretend they do not exist, the commissioner added. As a follow-up of the meeting, she proposed to organise a "more formal round table" at European level because the issues discussed did not concern Bulgaria only. It is an undeniable fact that media across Europe (and not only) are facing major problems stemming from the financial crisis, globalisation, technological development and a number of other factors. However, it is also true that Bulgarian media suffer from specific problems, originating from the local political landscape. Media diseases in our country are the same as those of all other public areas - lack of transparency in terms of ownership, unclear financing, conflicts of interest and unhealthy relationships between governments and businesses, non-compliance with professional and ethical standards. So we, the group of journalists who signed the letter to Ms Kroes, came up with a common position, asking the European Commission to include the Bulgarian media issue in the Cooperation and Verification Mechanism (CVM), in order to make possible, like judicial reforms and the fight against organised crime and corruption, the Bulgarian media sector to be monitored and evaluated according to specific benchmarks. Not coincidentally, the idea of including the media environment in the CVM was suggested by euinside. As journalists, whose mission is to present to the public what is happening in the EU, the problems and challenges it is facing, we believe that the European Commission itself has recognised the need to have a special media monitoring in countries with unstable democracy. The EC has already changed its approach toward the candidate countries because of the failures with some new member states, like Romania and Hungary. For example, the Commission launched a special dialogue with Macedonia based on five points, the first of which is Macedonia to provide an environment for development of independent media. Although so far Bulgaria remained in the shadow of Romania and Hungary, without making the headlines in the European press, now there is every reason the country to get increased attention by its European partners. The fact that in five years Bulgaria has not been capable to overcome the problems monitored by the EC under the CVM, as well as its indefinite prolongation, shows the inability of the country to make this transformation alone. Mass media are an essential part of this transformation, and unless the media environment is not adequately reformed the CVM will never end, which means that Bulgaria will never be a full and equal EU member. Although the critics of the mechanism argue that it is a toothless tool that brings no results, this is not the case. The CVM is toothless because it approached the observed countries like equal partners that needed just a little help and some internal pressure for change. Alas, it turned out that this is not the case. The Commission itself emphasises in its reports that the mechanism will continue until there are durable and irreversible results. And there is no way to achieve them without exerting pressure for reform on the government, which is impossible without independent media and pluralism. There is no way to create social intolerance towards corruption, if media do not expose, do not criticise, do not comment. There is no way the voice of civil society to be heard if media feed at a state trough. We cannot talk about democracy if we do not have independent journalism. "Journalism is connected with democracy as without journalism there is no democracy," Ms Neelie Kroes noted. In other words, all the conditions to include the media environment in the CVM are available. And there is no place to demonstrate political correctness or react in express of affected national pride. We are where we are because of the lack of will to reform, so we need a strong external pressure. Otherwise, the problem will get worse, and this is not just a problem of Bulgaria, Romania or Hungary. This is a problem of the EU, whose foreign policy is based on promoting democracy and freedom of speech - something that is losing weight if the EU itself allows violations in the EU members themselves. The danger is further enhanced by the fact that Bulgaria is facing parliamentary elections in mid-2013, which means that in the coming months the close relation between the government and media will continue to be heating up, thus further challenging the loyalty to democracy and freedom of speech. The EU is also on the verge of choosing which path to go. President Barroso spoke of a federation of nation-states, of strengthening European political parties, in order to allow the EU to reach closer to its citizens. If there are no free media in some Member States to ensure the right of citizens to be informed, this is a problem not only of these countries and their national development, but also of the entire European Union.